We all know that the Isle of Wight is ‘the’ place to be on New Year’s Eve and Ventnor is no exception. So it’s no surprise to hear from friend and reader of VB, Norbie, that Twilight (blockbuster vampire films) stars Robert Pattinson & Kristen Stewart have been spotted in our dear town, Ventnor. 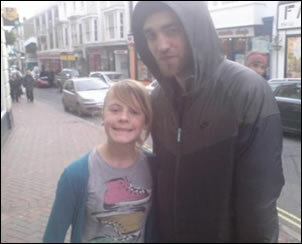 Charlotte Stockdale gave us the first heads-up at about 1pm this afternoon asking “is it true Robert Pattinson is on the IOW?” on Twitter. It’s anyone’s guess of where they’re heading tonight, but if you’re venturing out, don’t forget to take some garlic … and a camera to send us a photo. A friend of the girl in the pics who was asked to post these shots to Twilight fansites has given us permission to use them here, so many thanks to the fan in the photos who did well to spot the actors, for letting us use them here. 80 Comments on "Robert Pattinson & Kristen Stewart (Robsten) Spotted in Ventnor: Updated (photos)"
They’re probably going to that event at Ventnor Winter Gardens! Do you know if the Pretty Things performed on the Ventnor Winter Gardens NYE party? Does that mean if I see Kirsten Stewart, I CAN scream? if that’s true good for them!! I’d love to catch a glimpse, just to see if he’s really that good looking!!! It’s nice they chose the IW as somewhere to spend new years. How exciting ;) So happy for Rob and kristen. May i ask what day you saw them? Was it on the 26th? Also, how long is the Boxing day display up for? how exciting to see the pictures! glad they are together. happy new year from canada. OMG!! HNY to all!! When was this pic taken?? ?Can anyone post links from the original source or owner? ?Can someone confirm if this is in ventor?? So Robsten is real or they are still so super gooooooooooood friends??? its deffo ventnor, i know the street. my mate from school lives like 10 min walk from where the photo was taken. I met Rob on the fastcat on Weds :) very sweet. Would you like to tell us more? Cause i’m dying here. Not much to say. 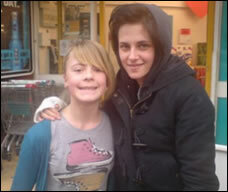 Kristen was a bit plain-faced, and short! Surprisingly. He was nice. I poked him and told him I love the films and he was grateful :) and beardy! was rob only with kristen or did they have people with them? sorry, just curious. I’m a huge Robsten fan, and am so thrilled they have spent the holidays together. Its also great if you see or meet them along the way. However, I think most Robsten fans would rather their location not be disclosed. The pappz and/or “crazed” fans will invade in no time. Give them some much needed space. Yes it is in Ventnor Somerfield supermarket if u look for the store at IOW you can c the pic it’s the same store. This really made my day. Seeing something about them. Great job 4 hiding from paps. Happy New Year. It’s made my day. Happy for both and hope they enjoy their holidays together. What a start for the New Year and a Statement at that! It’s amazing there’s no paps around. Can understand the “Boxing Day” event being an Aussie. Mainland press agencies were all closed up for Xmas/NY anyway, so would have been hard to get some images circulated in a reasonable time. So glad to see the people on the IOW have some class and are not hounding them, kudos to all of you who have seen them and haven’t crowded them!! Who are these people? Are they local? Do they covet the precious things? They are Hollywood actors/actresses. Starred in Harry Potter, Twilight etc. Not local at all, however it appears their family are. regards from valencia venezuela! hny this news is SO exciting!!!!!! i dont know why but i do really like them together!!! it’s been days… Are they still there? or Did anybody see them lately somewhere around iow ? Rubbish – any star who has their photo taken these days knows that it’ll end up online almost instantly. They’ve probably long since left Ventnor now anyway. That true!! We should respect their privacy!! I can’t tell u why but I also want the 2 of them to be together. They got me with the first kiss in Bella’s bedroom. I loved the picture of them holding hands in Paris on the tarmac. I am so glad they were able to have some private time. All of your comments have been so kind. Regards from Va, USA. I agree, the photos should not have been posted – they let those photos be taken for the enjoyment of a fan, not to create a frenzy. if you are a Robsten fan, then let them have a bit of peace alone. This is tHEIR time off, let them enjoy it. Good for them, I hope they’re happy, regardless. Please, people, don’t scream. have a little class. I agree, the photos shouldn’t have been posted on the internet. Give them their space, they’re people too and deserve some privacy. Looking plain doesn’t automatically mean you’re ugly – just plain. They look so happy. :) I know someone who ran into them in the area and they said they saw them on the streets but they looked couple-ly. There was physical contact and hand holding along with some arms around each other. No they’re not on the isle of white, they’re taken on the isle of wight! And yes they most definitely are. Both pictures are clearly recognisable as being in Ventnor and there were lots of other people around when the pics were taken. They still around? Its all so exciting!!! I bet they hate that kid. lol. glad to see KStew and RPattz together in New Years Eve. what a good sign to start 2010. well,i hope in this so-called relationship will end up in marriage or else they might end up saying “i am single…again”. If they REALLY want to be anonymous – they should come to the ISLE OF SHEPPEY !!!!!!! nowt but sheep here – hence name. We would love to see them both and buy them a cuppa tea to warm up !! if tht were me i woudld probs faint !!! now i ave gt 2 run into him with his shrirt off ! !